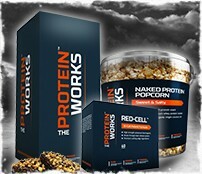 New products are what we are all about at THE PROTEIN WORKS™. Dubbed, “the most innovative sports nutrition brand” by the fitness and sports media it’s possible this could be the most exciting part of THE PROTEIN WORKS™ website. That’s because our innovation and imagination doesn’t stop at our best-selling whey protein. Nor is it confined to our widely-acclaimed creatine. No, THE PROTEIN WORKS™ laboratory is much more active and inventive than that as you’ll see from this ever expanding corner of the site. Firstly, one thing that separates us from other brands out there today is the fact we are open and transparent about exactly what ingredients go into making each new supplement that leaves TPW™. For example, if you see a new protein powder in the new products range but you are unsure what’s in it. Simply click on the Protein Insight icon to find out more on each protein product page. With TPW™, not only is quality assured, but our prices are low to ensure you get incredible value for money every time. When it comes to new products we truly want to listen to what our customers want. We always say at THE PROTEIN WORKS™ that the lab door is always open. So if you have a new product idea we want to hear about it. Talk to us in THE LOCKER ROOM™ or maybe take to Twitter, Facebook, Google Plus or Instagram. Basically, if there’s a new protein shake idea you have, maybe a twist on a current whey protein isolate or protein bar formula we want to know. There’s no such thing as a suggestion so please don’t hesitate to get in contact. Anything you want in your protein shaker we can probably make happen.